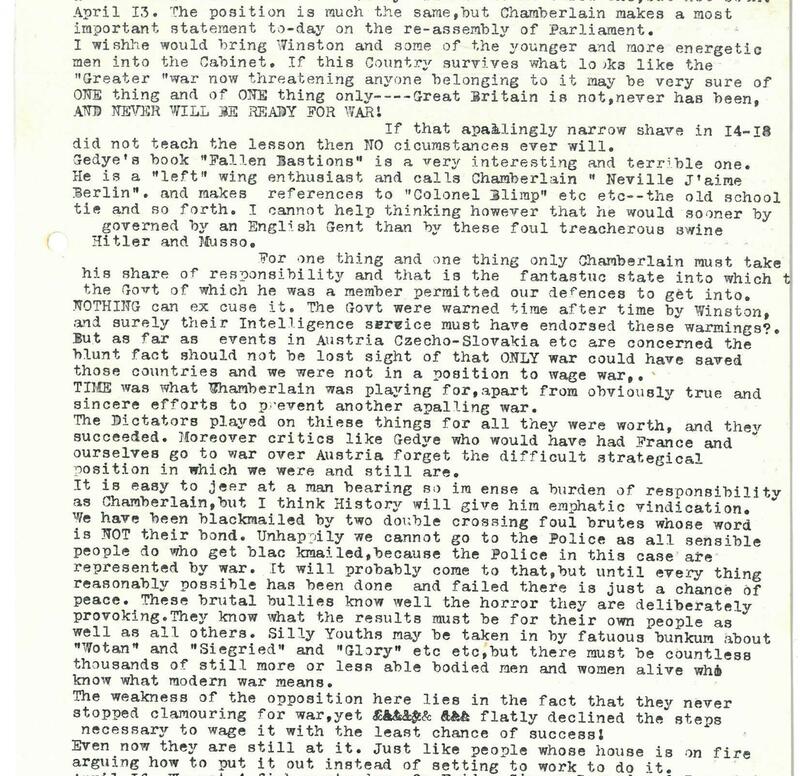 In this diary entry, Thomas Graham refers to the man who would become Britain’s wartime Prime Minister, Winston Churchill. 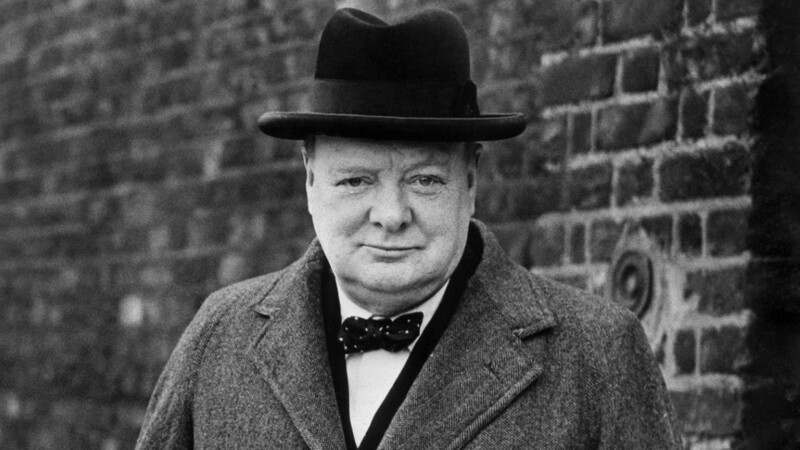 Thomas was a great supporter of Churchill and approved of his stance on both appeasement and rearmament. Given that he refers to Churchill as ‘Winston’, it is possible that he might have been acquainted with the wartime leader as both men had military careers and were of a similar age. 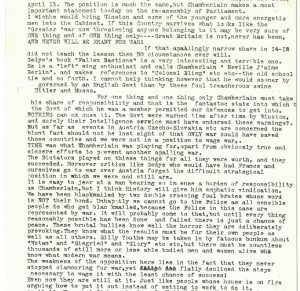 In 1939, Churchill was not a Cabinet member, largely because he was at odds with Chamberlain on the very issues that Thomas continually highlights. Thomas shares Churchill’s anxiety that ‘Great Britain is not, never has been AND NEVER WILL BE READY FOR WAR’. Again, Thomas Graham shows his engagement with international politics when he mentions having read the book ‘Betrayal in Central Europe – Austria and Czechoslovakia: The Fallen Bastions’ by G.E.R. Gedye. 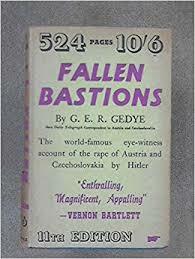 This book had just been published in Britain in 1939 and, like the volume ‘A pact with Hitler’ by Martin Fuchs that he describes having read at the beginning of the month, this volume deals with the German seizure of Austria in 1938 along with the invasion of Czechoslovakia in March 1939. George Eric Rowe Gedye is a very interesting character. He worked as a foreign correspondent in Vienna and three days after the Anschluss he was deported from Austria by the Gestapo as an undesirable alien. He then went to Prague where he stared writing his book. The book attacked the British policy of appeasement and cited the British Government as being complicit in the betrayal of both Austria and Czechoslovakia and the subsequent suffering of the people living there. This suffering was severe; concentration camps were built by the Nazis at Mauthausen-Gusen near Linz in Upper Austria and at Theresienstadt near Prague and Czech and Austrian Jews and other peoples classed as ‘undesirables’ by the Nazi regime were murdered in both camps. After the invasion of Czechoslovakia in March 1939, Gedye was forced to hide in the attic of the British Embassy for 10 days until he was able to escape the country. He then went on to Poland and later Moscow and continued his reporting about the progress of the war. 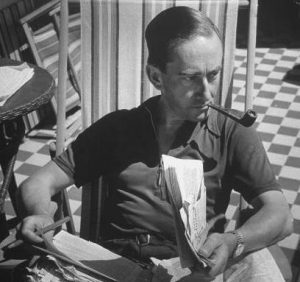 Although Thomas does not agree with every conclusion that Gedye makes in his book, the fact that he is reading it indicates how open minded he was and how keen to inform himself about exactly what was going on in Europe and what the motivation of the Nazis was for their expansionist activities. Thomas has a robust contempt for the Nazi ideology here roundly condemning the ‘fatuous bunkum about “Wotan” and “Siegfried” and “Glory”‘ referring to Hitler’s fascination with Germanic myths that he used to support his ideology and imperialist ambitions.